While a reefer will have an integral refrigeration unit, they rely on external power, from electrical power points (“reefer points”) at a land based site, a container ship or on quay. When being transported over the road on a trailer or over rail wagon, they can be powered from diesel powered generators ("gen sets") which attach to the container whilst on road journeys. Refrigerated containers are capable of controlling temperature ranging from -65 °C up to 40 °C. Water cooling systems are more expensive than air current ventilation to remove heat from cargo holds, and the use of water cooling systems is declining. Air cooling and water cooling are usually combined. Air cooling removes the heat generated by the reefers while water cooling helps to minimise the heat produced by the reefers. The reefers are using some heat exchangers that behaves as water cooled condensers: water cooling. Another refrigeration system sometimes used where the journey time is short is total loss refrigeration, in which frozen carbon dioxide ice (or sometimes liquid nitrogen) is used for cooling. The cryogenically frozen gas slowly evaporates, and thus cools the container and is vented from it. The container is cooled for as long as there is frozen gas available in the system. These have been used in railcars for many years, providing up to 17 days temperature regulation. Whilst refrigerated containers are not common for air transport, total loss dry ice systems are usually used. These containers have a chamber which is loaded with solid carbon dioxide and the temperature is regulated by a thermostatically controlled electric fan, and the air freight versions are intended to maintain temperature for up to around 100 hours. Full size intermodal containers equipped with these "cryogenic" systems can maintain their temperature for the 30 days needed for sea transport. Since they do not require an external power supply, cryogenically refrigerated containers can be stored anywhere on any vessel that can accommodate "dry" (un-refrigerated) ocean freight containers. Valuable, temperature-sensitive, or hazardous cargo often require the utmost in system reliability. This type of reliability can only be achieved through the installation of a redundant refrigeration system. A redundant refrigeration system consists of integrated primary and back-up refrigeration units. If the primary unit malfunctions, the secondary unit automatically starts. To provide reliable power to the refrigeration units, these containers are often fitted with one or more diesel generator sets. The reefer cannot be loaded in double-stack on rail flatcar. ^ "Reefer container meaning and definition". Alconet Containers. Retrieved 23 April 2018. ^ a b "Refrigerated transport: Progress achieved and challenges to be met" (PDF). International Institute of Refrigeration. August 2003. Retrieved 2010-05-01. ^ a b "History". Cryo-Power Enterprises LLC. Archived from the original on June 27, 2009. ^ Refrigerated container with temperature control RKN series and RAP series Operation manual (PDF). Envirotainer Engineering. August 2001. Archived from the original (PDF) on 2017-10-08. Retrieved 2010-05-01. 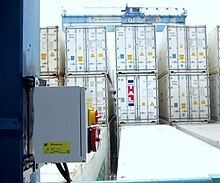 Wikimedia Commons has media related to Refrigerated containers. This page was last edited on 31 January 2019, at 18:59 (UTC).